The forum has lost all formatting... it's just a bunch of text flowing down the page. Looks like the CSS or whatever is broken as far as the latest Firefox can see. It does still work in Internet Explorer. Firefox Quantum here: 57.0.3 (64 bit) working fine, just upgraded to 58.0.1, also OK.
Maybe you need to upgrade? 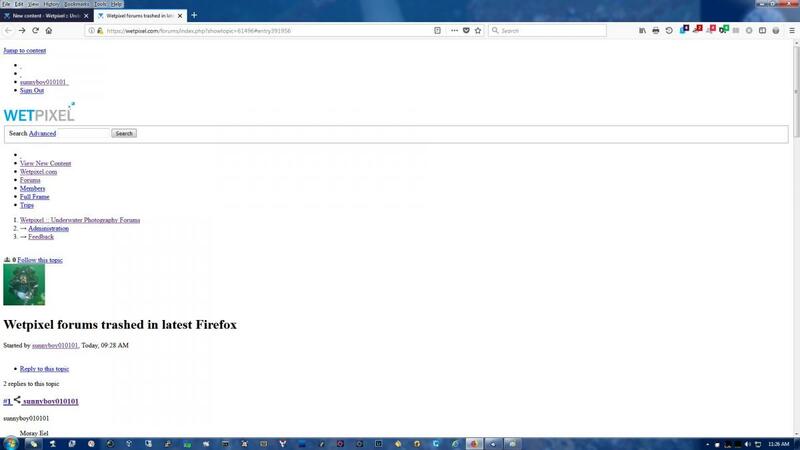 As I also use Firefox and have no problems, as has trimix , I think it is not a general wetpixel or Firefox fault but limited to your installation. can you just not trash the temporary files, the cache or whatever? I solved the problem. I tried starting Firefox (58) in safe mode, and all was well. So I went to the add-on manager and started turning things off until wetpixel worked. It turns out the problem is the add-on "DuckDuckGo Privacy Essentials". The date/version is 2018.2.1 so that's why everything started failing on Feb 1. I may diagnose further to see what "thing that they are blocking" is the culprit, but not installing it or disabling it solves the issue with this site. Last quick update: I enabled DDG privacy essentials and had a look at what it didn't like about this site. There are trackers and some other issues, but I whitelisted wetpixel and now it again works. The overall issue is the css files aren't being loaded with the privacy settings on full for some reason (probably trackers as these get blocked).